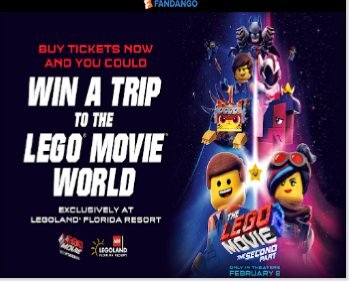 Fandango The LEGO Movie 2: The Second Part Sweepstakes – Win a trip to LEGOLAND! Win a trip to LEGOLAND in Florida! ENTER SWEEPSTAKES HERE – Fandango Sweepstakes page. ENTRY LIMIT – Limit of ten (10) Entries in total per person, per VIP Account (as applicable), per e-mail address and per household during the Promotion Period, regardless of method of entry (or combination thereof). ELIGIBILITY – “The LEGO Movie 2: The Second Part Sweepstakes” presented by Fandango is open only to legal residents of forty-nine (49) states of the United States (the “U.S.”) and the District of Columbia (void in Rhode Island, Puerto Rico, all U.S. territories and possessions and all overseas military installations) who are at least eighteen (18) years of age (or the age of majority in their state of residence, whichever is older) as of February 1, 2019, with access to the Internet at all times during the Promotion Period. SWEEPSTAKES ENTRY PERIOD – The Sweepstakes entry period begins at 9:00 a.m. Pacific Time (“PT”) on February 1, 2019 and ends at 9:00 a.m. PT on February 22, 2019. PRIZES – One (1) grand prize will be awarded in this Sweepstakes to one (1) Grand Prize Winner. The Grand Prize shall consist of a three (3) night trip to Winter Haven, Florida on dates to be determined by Sponsor and/or Prize Provider for Grand Prize Winner and three (3) guests. The Trip includes: $500 in airfare credit for Winner and three (3) Guests (approximate retail value (“ARV”): $2,000); three (3) night hotel room accommodations at LEGOLAND® Florida Resort with one (1) standard theme room with king bed plus separate child sleeping area with bunk beds for two (2), all details determined by Sponsor in its sole discretion (ARV of hotel room accommodations for three (3) nights: (ARV: $1,125); two-day Resort tickets(ARV: $546)); family gift pack in the hotel upon arrival (ARV: $200), LEGOLAND Dollars upon arrival to use towards food & beverages (ARV: $100). The total ARV of the Grand Prize is three thousand nine hundred seventy one dollars and zero cents ($3,971.00 USD). The actual value of Grand Prize may vary depending on the number of travelers, location of Winner and hotel accommodations. Any difference between the estimated ARV and the actual value of the Grand Prize will not be awarded. 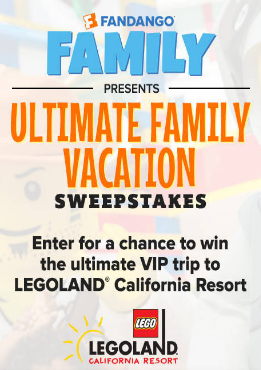 Fandango’s “Ultimate Family Vacation LEGOLAND® California Resort” Sweepstakes – Win a trip to LEGOLAND California Resort! 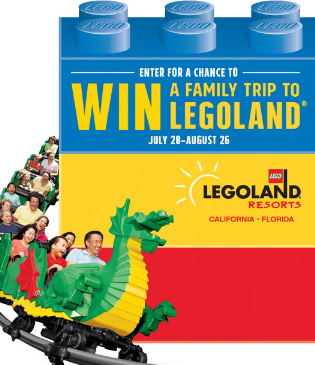 Win a trip to LEGOLAND California Resort! ENTRY LIMIT – Limit one (1) Entry per person, per household, per email address regardless of the number of email addresses a person may have. ELIGIBILITY – Fandango’s “Ultimate Family Vacation LEGOLAND® California Resort Sweepstakes” is open only to legal residents of the forty-nine (49) states of the United States (“U.S.”) and the District of Columbia (void in Rhode Island, Puerto Rico, all U.S. territories and possessions and all overseas military installations) who are at least eighteen (18) years of age or older (or the age of majority in their state of residence, whichever is older) as of June 1, 2016. SWEEPSTAKES ENTRY PERIOD – The Sweepstakes entry period begins at 10:00 a.m. Pacific Time (“PT”) on June 1, 2016, and ends at 10:00 a.m. PT on June 30, 2016. Airfare for Grand Prize Winner and three (3) guests on the airline of Sweepstakes Entity’s choice from a major airport near Winner’s home and in Sweepstakes Entity’s sole discretion, to a major airport near LEGOLAND California Resort. Approximate Retail Value (“ARV”) $2,000 (maximum $500 flight credit per Guest). Two (2) nights’ stay at LEGOLAND Hotel at LEGOLAND California Resort in fully themed LEGO suite. ARV $1,200. Two (2) days’ Ultimate Overnight VIP Experience with two (2) day admission to SEA LIFE Aquarium and LEGOLAND Water Park for Grand Prize Winner and Guests. ARV $5,600. Two (2) hour exclusive model building session with LEGOLAND Master Model Builder and exclusive tour of the LEGO Model Shop. ARV $1,200. TOTAL ARV OF GRAND PRIZE TO BE AWARDED IN THIS SWEEPSTAKES: ten thousand dollars and zero cents ($10,000.00 USD). TRAVEL MUST BE COMPLETED BY June 30, 2017. The Children’s Place & LEGOLAND®: 30 Days of Awesome Sweepstakes – Win a trip to LEGOLAND! Win a trip for 4 to LEGOLAND! ENTER SWEEPSTAKES HERE – The Children’s Place Sweepstakes page. ENTRY LIMIT – Limit of one (1) entry per person, per email address, per day, throughout the Promotion Period for a total of thirty (30) entries. ELIGIBILITY – The Promotion is open only to legal residents of the 50 United States and D.C., Canada (excluding Quebec), and Puerto Rico, who are at least 18 years of age or older as of date of entry (except in Alabama, Nebraska, British Columbia, New Brunswick, Newfoundland, Nova Scotia, Northwest Territories, Nunavut, Yukon participants must be 19 years or older to enter, and in Mississippi and Puerto Rico participants must be 21 years or older to enter). SWEEPSTAKES PERIOD – The Children’s Place & LEGOLAND®: 30 Days of Awesome Sweepstakes begins at 09:00:00 AM Eastern Time (“ET”) on July 28, 2015 and ends at 11:59:59 PM ET on August 26, 2015. PRIZES – One (1) Grand Prize winner and five (5) Runner Up Prize winners will be selected. Odds of winning a Promotion prize depend on the number of eligible entries received. The ARV of each Runner Up Prize is $75.98 USD/ $91.14 CDN. 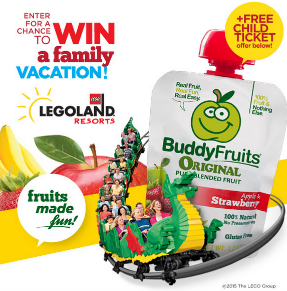 Buddy Fruits LEGOLAND Sweepstakes – Win a trip to LEGOLAND! Win a trip to Legoland! ENTER SWEEPSTAKES HERE – Buddy Fruits Sweepstakes page. ENTRY LIMIT – Limit of 1 entry per person, per email address. ELIGIBILITY – The Sweepstakes is open only to legal residents of the United States and Canada (excluding Quebec), 18 years of age or older as of the date of entry. SWEEPSTAKES PERIOD – The Buddy Fruits LEGOLAND Sweepstakes begins at 12:00 a.m. Eastern Time (“ET”) on March 01, 2015 and ends at 11:59 p.m. ET on April 30, 2015. PRIZES – Grand Prize (1): A 3 Day/2 Night trip for four to one LEGOLAND Park of the winner’s choice. Trip includes round trip coach air transportation for four from major airport nearest winner’s home, hotel accommodations (one room, quad occupancy and a 2 day pass to the LEGOLAND Park of winner’s choice (ARV: USD $2,995). First Prize (50): Two (2) tickets to a LEGOLAND Park of the winner’s choice. Transportation to/from the park is not included with prize (ARV: USD $30 each). 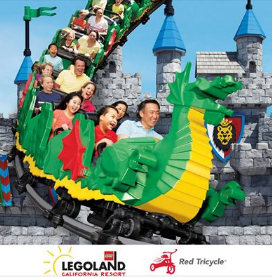 Red Tricycle LEGOLAND California Resort Giveaway Sweepstakes – Win tickets to LEGOLAND California! Win a Family 4-Pack of tickets to LEGOLAND California! ENTER SWEEPSTAKES HERE – Red Tricycle Sweepstakes page. ENTRY LIMIT – Limit is one entry per email address and by participating in this sweepstakes program, you are automatically signed up for Red Tricycle’s free e-mail newsletter. ELIGIBILITY – This Sweepstakes is open to all legal residents of the United States and District of Columbia, and U.S. Military personnel (and their families) with APO/FPO addresses, who are eighteen (18) years of age or older. SWEEPSTAKES PERIOD – Contest period – August 26, 2014 through October 16, 2014 at 11:59 pm PST. 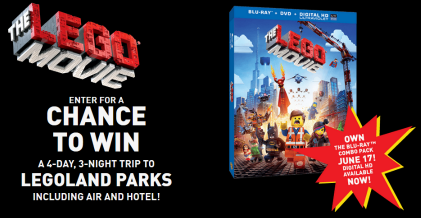 Warner Bros. Entertainment “The LEGO® Movie” Sweepstakes – Win a trip to LEGOLAND & more! Win a trip to LEGOLAND California or LEGOLAND Florida for 4 & more! ENTER SWEEPSTAKES HERE – Warner Bros. Entertainment Sweepstakes page. ENTRY LIMIT – Limit one (1) entry per person or e-mail address per twenty-four (24) hour period during the Promotion Period, regardless of the number e-mail addresses or accounts a person may have. ELIGIBILITY – The “The LEGO® Movie Sweepstakes” is open only to legal residents of the 50 United States and the District of Columbia, who are at least 18 years of age (or the age of majority in the jurisdiction of their residence, whichever is older) at time of entry and have internet access/valid e-mail address as of May 19, 2014. SWEEPSTAKES PERIOD – Sweepstakes begins on or about 5:00:00 p.m. Eastern Time (“ET”) on 5/20/14 and ends 11:59:59 p.m. ET on 6/30/14. PRIZES – GRAND PRIZE (1 winner): Grand Prize winner will receive one (1) certificate valid for a vacation package for a four (4)-day/three (3)-night trip for him/her and up to three (3) guests to their choice of either LEGOLAND California or LEGOLAND Florida. Trip consists of roundtrip economy class air transportation provided by Delta Vacations from the closest major commercial airport near winner’s residence to San Diego, California or Orlando, Florida for the winner and up to three (3) guests (valued up to $750 per person); three (3) nights’ standard hotel accommodations (one (1) room, quad occupancy) at a participating Delta Vacations hotel, valued at up at $1,000; up to four (4) three (3) day base tickets to LEGOLAND California or LEGOLAND Florida; and The LEGO® Movie 3D Blu-ray Combo Pack. ARV of Grand Prize: $4,100.00. Grand Prize trip must be booked by 6/30/2015 and travel must be completed by 7/31/2015. First Prize (10 winners): Each First Prize winner will receive one (1) The LEGO® Movie Super Cycle Chase set and one (1) Blu-ray Combo Pack of The LEGO® Movie. ARV of each First Prize: $75.00. Red Tricycle LEGOLAND California Hotel & Resort Giveaway Sweepstakes – Win tickets to LEGOLAND & more! Win a one night stay at the LEGOLAND Hotel in Carlsbad, CA, and 4 LEGOLAND California Resort Hopper Tickets (travel not included)! Plus, everyone who enters will receive a FREE child ticket with one paid adult ticket to LEGOLAND California resort! ENTRY LIMIT – Limit is one entry per email address and by participating in this sweepstake program, you are automatically signed up for Red Tricycle’s free e-mail newsletter. SWEEPSTAKES PERIOD – May 7th, 2014 through June 15th, 2014 at 11:59 pm PST. Everyone who enters the giveaway gets a free child ticket with one paid adult ticket to Legoland California Resort. The coupon code will be sent in the giveaway entry confirmation email. 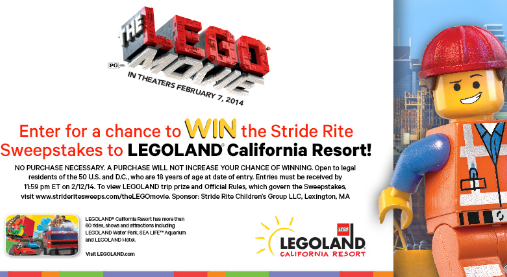 Stride Rite Sweepstakes – Win a trip to Legoland California! Win a trip for 4 to Legoland California! ENTER SWEEPSTAKES HERE – The Stride Rite Facebook page. ENTRY LIMIT – Limit one entry per person, per email address. ELIGIBILITY – The Sweepstakes is open only to permanent legal residents of the forty-eight (48) contiguous states of the U.S. or the District of Columbia, who are physically located and residing therein (excluding Alaska and Hawaii), who are eighteen (18) years of age or older at time of entry. SWEEPSTAKES PERIOD – The Stride Rite Children’s Group LLC’s “Stride Rite Sweepstakes” begins on Monday, January 13, 2014, at 12:00:01 AM Eastern Time (“ET”) and ends on Wednesday, February 12, 2014, at 11:59:59 PM. ET. RULES – See sweepstakes rules here (on entry).